Princess Anne has opened six operating theatres and a revamped children's ward at a hospital famous for its pioneering work with burns victims. The Princess Royal unveiled the £12m facility at Queen Victoria Hospital (QVH) in East Grinstead as part of its 150th anniversary celebrations. She toured the theatres, spoke to staff and patients and unveiled a plaque. The QVH is the South East's specialist centre for reconstructive surgery, burns and eye care. It is known for its link with plastic surgeon Sir Archibald McIndoe who pioneered new treatments for badly burned World War II airmen on the site. Seven-year-old Katie Wondin, who had recently underwent surgery to reconstruct the skin on the top of her head, presented Princess Anne with a bunch of flowers. Her parents, Gary and Tonia Wondin, said: "Katie was so excited to meet Princess Anne. "It was a wonderful treat for her after having an operation the amazing team at QVH has spent the last seven years preparing her for. "We can't put into words how fantastic the care and treatment we have received at QVH has been with such an amazing outcome." 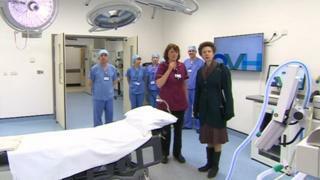 Matron Jo Davis said: "It was a pleasure to meet Princess Anne and to show her around. We've been working on the new theatres for a long time and it's great that our patients are now benefiting from them. "We've always had excellent teamwork in our theatres, but these new facilities help us offer the very best care, making things much easier and more comfortable for our patients." The QVH was originally called the East Grinstead Cottage Hospital when it was founded in 1863. It became known as the Queen Victoria Hospital in the 1930s and moved to its current site in 1936.